이 불경은 대승불교가 일어나기 전의 상좌부(上座部)에서 갈라져 나온 설일체유부(說一切有部)의 사상을 알 수 있는 대표적인 논장(論藏)인 육족론(六足論) 가운데 하나로, 설일체유부의 논장에 통달한 세우존자가 저술한 것을 당나라의 승려인 현장이 한역한 것이다. 이 판본은 해인사 고려대장경 판과 비교해 보면 우선 판식이 동일하다. 그러나 초조본은 판수제이고 책의 장수 표시가 ‘장(丈)’으로 되어 있는데, 해인사본에는 판미제에 장수 표시가 ‘장(張)’으로 되어 있다. 그리고 책 끝에 있는 간행기록이 초조본에는 없는데 해인사본에는 있다. 또한 초조본에는 한 획이 탈락되어 있는 글자가 보이고 있는데 해인사 본은 바로 잡아 놓았다. 이 판본은 고려 현종 때 부처님의 힘으로 거란의 침입을 극복하고자 만든 초조대장경 판본 가운데 하나로, 보존 및 인쇄상태가 뛰어나 서지학ㆍ불교사연구에 매우 귀중한 자료로 평가된다. This Buddhist scripture is part of the Abhidhamma-pitaka of the Sarvastivada school, a sect that broke away from Sthaviravada as a religious order that preceded Mahayana Buddhism. It was written by Vasumitra, who was well-versed in Abhidhamma-pitaka, and translated into Chinese by Xuanzang, a Buddhist monk of the Tang Dynasty of China. This scripture uses the style of woodblock print similar to that of the Tripitaka Koreana in Haeinsa Temple. The scripture kept at Haeinsa Temple provides publication-related information at the end, but this one does not. This scripture contains Chinese characters with a stroke missing, but the one at Haeinsa Temple set them straight. 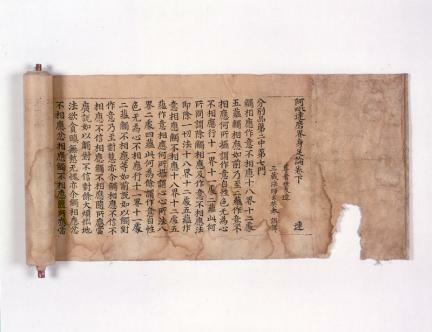 This scripture is a printed edition of the First set of Tripitaka Koreana, made in an effort to block the Khitan’s invasion with the help of Buddha during the reign of King Hyeonjong (r. 1009-1031) of Goryeo. The status of printing is good, and it has been preserved well. Thus, it is regarded as a valuable material for those studying bibliography as well as the history of Buddhism.